Sandeep Dutt, School Coach and the Founder Learning Forward India partners Karl Clauset for school culture transformation in India. Free online resources with the book. Genuine effective school improvement requires leaders and teachers to be part of a broad-based, creative change system that focuses on generating improved teacher practices for enhancing student learning. This guide provides a step-by-step, systemic approach to the change creation process. How can we really create lasting change? By applying the Change Creation system! Learning community pioneers Dale Lick, Karl Clauset, and Carlene Murphy lead teachers, principals, and schools in this dynamic approach to school improvement. 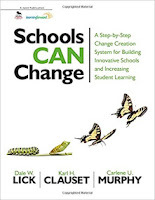 With a free, comprehensive online collection of practical resources, this book shows you how to: Develop the right vision, relationships, and culture to create and sustain change Model learning-inquiry cycles for action teams for success Build loyalty, trust, and responsibility within your teams and across the school.